In order to correctly diagnose asthma, most children especially under the age 12 are seen and assessed by a paediatric doctor or a GP and Nurse with a specialist knowledge in asthma. Most adults are seen and assessed by their GP or asthma nurse in the surgery. Lung function and reversibility tests are carried out and if necessary allergy testing also. Do not hesitate to talk about it with your GP and to ask for investigations if you suspect your have asthma. Indeed, episodes of cough, breathlessness, respiratory discomfort, repetitive bronchitis can be signs of asthma. It can be difficult to diagnose a child under the age of 5. However, you should not wait until the child is 5 to have them tested: the earlier asthma is diagnosed and treated, the more likely the child will live normally and see his asthma improving. Otherwise, asthma may worsen. Latest update on January 2, 2011 at 03:32 PM by Janey39. This document, titled "See your GP to get diagnosed," is available under the Creative Commons license. Any copy, reuse, or modification of the content should be sufficiently credited to CCM Health (health.ccm.net). 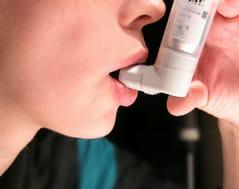 Asthme : Quel médecin consulter ? A quién se debe consultar cuando se es asmático Asthma: Welchen Arzt sollte man konsultieren?